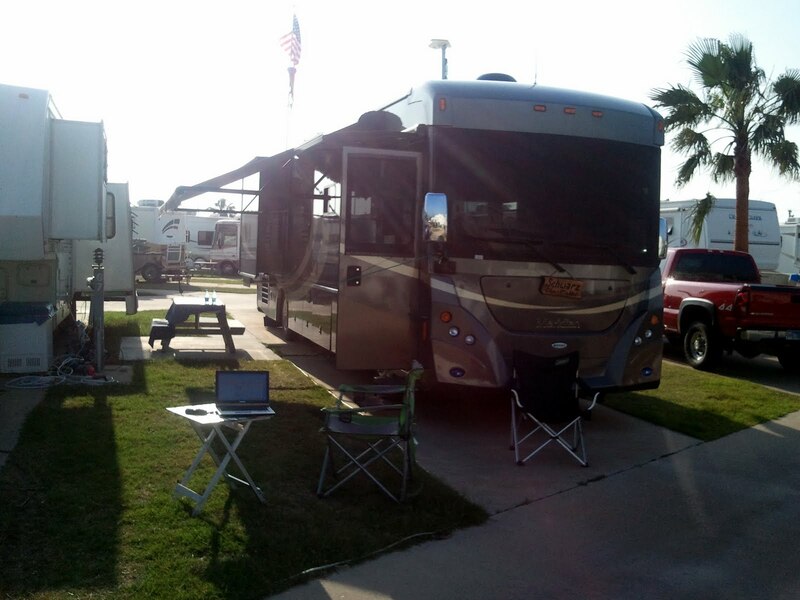 Port Aransas - Part II - C U on the Road! Check Photo Gallery for new pictures. We have been settling into a routine, sort of. We have done some exploring and met a few other Winter Texans. The RV park where we are staying has a social on Saturday nights. We have been to an Ice Cream Social, Fish Fry, and Bingo so far. One of the women came up to me and asked me what I was doing there. I'm much too young! She became my new best friend. Ellie learned a new game called 'Farkle'. It has something to do with 6 dice and yelling Farkle a lot. It's like Yatzee but more fun. We decided that all this 24/7/365 togetherness could potentially put some stress on our relationship; especially since we are living in about 350 square feet. There may be some times when one (or both) of us needs some alone time. Our first line of defense against this is the 'spare room'. If it gets too crazy in the house, one of us can go outside to the guest house. If we need to take it one step farther, we agreed on a safe word. As every RVer knows, Walmart is a camper's best friend. During weekend camping, it's rare that there's not at least one trip to Walmart. So...our safeword is Walmart. That means the other person's first thought shouldn't be "OK, let's go!" That means that one of us needs to put some space between us, pronto! Down on the beach we discovered some people doing sand sculpture. There is a sand castle festival in April. Alas, we'll miss it. We also heard about a restaurant that had a display of semi-permanent sand castles so we went to take a look. It's right down the street from where we are staying. Take a look at the detail in these and remember that they were sitting outside during the torrential rain we had the other day! We were assured they are made of sand, not cement! Check the blog later for one of our creations. We can't promise it will be "G" rated so check before you let the kids see it. We have been in larger sites in the past. 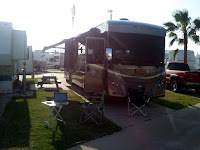 We have also been to Port Aransas in the past. While the site we were in last time was nicer in terms of size and landscaping, we both agree that this site is much better. It's in the center of town instead of being 5 or six miles out of town. There is really no need for the car unless we need to go to another town. Next, we have met some delightful people here. Lastly, it's half the price as the other park and it has more amenities! The mysteries of the Farley Boats, fishing, spring break, and more! Stay tuned.